Try the new experience for registered and drop-in programs. You can return to this page at any time. Stretching is an important aspect of a complete workout that is often neglected. Stretching provides many benefits some of which include releasing tension in the muscles, reducing the risk of injury, reducing soreness, increasing range of motion and boosting flexibility - all of which include improve your quality of life. "Long Term Success to Health and Fitness"
We live in a world obsessed with quick fixes and instant results to health and fitness. The reality is that there is no quick fix, no easy way, and no magic weight loss plan. All good things in life, take time, hard work, and patience; they can't be forced or rushed. This is why the "Law of the Farm" reference in the book Seven Habits of Highly Effective People by Stephen Covery is both informative and comforting. Have belief in the system. Wait for results (a crop); it will happen, not in days, but in weeks and months. Similar to farming, an exercise program will not have immediate results, but if you are diligent and consistent with both diet and exercise, you will eventually see results over a period of weeks and months that will yield long term success. Just like crops that require water and proper feeding, a successful exercise program includes the right amount of exercise and a well-balanced diet. The Law of Farm is good reminder that we reap what we sow and care for. "Shape Up Your Mindset AND Your Body!" If your mind is into following a healthy and fit lifestyle, your body will follow. Be Positive and use positive affirmations when acknowledging the healthy lifestyle you want to live. Surround Yourself with Positive People that support you and encourage you to work toward the goals that you want. Don¿t Beat Yourself Up. Know that you may mess up, and that no one is perfect. Use Social Media: Research, LIKE, and FOLLOW websites and blogs on social media that encourage healthy exercise and eating. And most importantly, choose a workout you enjoy! Find what it is that truly motivates you and makes you happy. There are so many options at your local Community Centre like Zumba, Step, Hi/Lo Aerobics, Spinning, Pilates, Yoga and Bootcamp. A proper warm-up is an important part to any exercise session. Warming up your muscles and joints before a workout has been proven to reduce the risk and incidence of injury! A good warm-up also ensures that you are getting the most out of your training session. Muscles are able to perform better and are stronger after they have been warmed up. By warming up, you are preparing your body for the stresses that will be placed on it during your workout. How do I warm-up? There are several different methods of warming up including: foam rolling, dynamic (moving) stretches, light resistance band work, body weight exercises, and light full-body cardio. You can also perform resistance exercises that you will be doing at a lighter weight than you would use during your sets. Your warm-up should last five to ten minutes, maybe more, depending on the type of workout you will be doing and for how long. So next time you think about skipping your warm-up, remember that warming up will help reduce your risk of injury and help you lift more weight during the workout! One of the most common goals of fitness goers is to reduce the size of the waist and to flatten out the belly. It's possible, but you'll have to use the right combination of full-body muscle building (resistance training) and cardiovascular exercise (jogging, treadmill, sports, biking, etc). Contrary to popular belief, doing hundreds or thousands of sit ups, crunches, and other abdominal exercises won't necessarily give you a flat stomach! Doing those exercises will certainly improve your abdominal strength and endurance, but to achieve a slimmer waistline you'll need to employ a broader approach. Just do abdominal exercises. Unfortunately just working out the stomach does not equal weight loss. Try to lose too much too fast. It's not sustainable or healthy! Incorporate resistance training for the full body into your routine. Don't worry, unless you eat and train like a body builder, you don't need to be worried about "looking too bulky". Try different equipment and find out what exercises you enjoy. For a workout to work, fitness has to be fun! Get regular cardiovascular exercise. Whether it be running, using a bike, playing squash or basketball, taking an aerobics class, or whatever, get out and do something! Aim to get 20-minutes of continuous movement and then continue to build up from there! Make healthy food choices when it comes to meals, snacks, and beverages. Be mindful too that although weight can very easily and quickly be put on, it can be difficult and slow to take off. The key is to be patient! Keep doing the right things, and over time you'll gradually get to your fitness goals. To learn more about getting in shape and becoming the shape you want to be, speak to one of our qualified Personal Trainers at your local Fitness Centre. Keeping in good alignment and form is far more important than speed and number of repetitions. The exercise loses it's effectiveness and can result in injury if performed with sloppy posture. If you feel your form slipping, take a mini break and re-align. "...Core Training in the mind of most Personal Trainers is much broader." The average person when they ask about or are reading about Core Training believe that the area in which is being discussed is directly in front of the body. You know the area " the six pack area". Well to clarify this for you Core Training in the mind of most Personal Trainers is much broader. To Core train any muscle group from the top of your knees to the top of your shoulders can be considered Core training. So, when you are performing exercises like, squats, dead lift, low back extension, or plank work these are all Core training exercises. Don't panic, if you think your Personal Trainer is not prescribing multiple exercises for your abdomen because they are considering the whole routine. To make sure your personal exercise program has an appropriate amount of Core Training in it see your Personal Trainer and ask them to evaluate your routine. "Remember, in order for the body to heal and recover, rest is imperative." With winter upon us, and our resolutions in full swing, the FLU and Illnesses might seem like a road block in our success. Remember, in order for the body to heal and recover, rest is imperative. Take a break from your exercise routine, but not from your diet. Eating healthy and maintaining a balanced lifestyle with proper rest will not only help you recover quicker, but it will also keep you in check with your resolutions and your fitness goals on track. "How to Choose a Personal Trainer"
Certification is the first thing to look for. Trainers need to have a strong knowledge base to provide you with a safe and effective work out. Not just any certification will do. You want a personal trainer that has been certified by a nationally recognized certifying organization. Make sure the trainer has liability insurance and provides business policies in writing. Many personal trainers are independent contractors and not covered under the fitness facility's insurance. Be sure to ask the trainer if they have professional liability insurance. A reputable trainer should also make sure you are aware of the cancellation policy and total cost for the service upfront. Rates vary, depending on the trainers experience and the length and location of the session. Trainers who work for a fitness club will probably charge less per hour that one who works independently and needs to come to your home or office. Look for a trainer who is able to assist your with your personal goals and needs. A trainer should always have you fill out a health history questionnaire. If you have any past injuries or medical conditions a personal trainer should design your programs taking these into account. Decide if this is trainer is someone you can work with. Will this person work with your time schedule? Does the trainer's gender matter to you? Do you think the trainer is genuinely interested in helping you?, Do you believe they love doing what they do? The answers to these questions will help you make the right choice to help you accomplish your goals. The City of Mississauga offers Personal Training at all 7 of our Fitness Centre locations. The trainers we hire are required to have a minimum of two years college or university education in a fitness related field and a Personal Training Certification from a nationally recognized organization that require on -going learning in order to maintain accreditation and Emergency First Aid / CPR. As employees of the City, all our trainers are covered with Liability insurance. Service fees are consistent from centre to centre and offer a variety of packages to suit your individual needs. After a complete screening and consultation our trainers are highly motivated to assist you in meeting your goals. "5 Tips To Help Stick With Your Exercise Program"
We all have busy lives. We book time in our planners for meetings and events. Making an appointment in your planner will help you stay on track, as you have assigned a date and time to exercise. We may not always have the desire to workout on a regular basis and especially on a busy day. Working out with a friend can make the workout more fun and provide the necessary motivation and accountability to stay on track. A trainer can keep you on track by designing a safe, effective and time efficient workout that will keep you motivated as you achieve your fitness goals. Attending a group fitness class with other people is not only fun, but the instructor can keep you motivated. A workout can be anything you want including a run, fitness class, or lifting weights. You are most likely to stick with an exercise program you enjoy. Finding what you enjoy will keep you more committed on a regular basis. "Which cardio machine/activity is the best?" Cardiovascular exercise is an excellent way to improve your athletic performance, tone up your body, and to trim those extra pounds. When posed with the question "which cardio machine/activity is the best?" the answer can be a bit tricky. Yes, some cardiovascular activities can be considered better than others from a calories-burned-per-hour standpoint, but the best cardiovascular activity is the one that you enjoy doing the most. Whether it's cycling, running, jogging, brisk walking, getting together with friends for a pickup game of basketball, swimming, using an elliptical, playing squash or taking a Zumba class, the key aspect of an effective cardio routine is working hard while also having fun. Enjoying exercise will dramatically improve your ability to adhere to a fitness program. Remember: time flies when you're having fun, and pounds melt away when you're doing cardio - so combine the two, and you'll be on your way to achieving your fitness goals! "Look into adding some outdoor activities into your fitness program." Here is a list of a few and approximate calories burned. Keep in mind that you still need to follow a well rounded fitness program. Strength and flexibility training should not be eliminated during the summer months, but you can definitely modify them due to the increased activity. Many outdoor activities involve repetitive movements so you will still want to keep up with your gym program to train all muscle groups. Regular stretching and or Yoga will keep the muscles and joints flexible to avoid injuries. 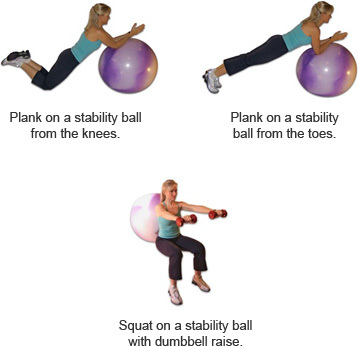 One of the many advantages of Pilates is to keep the core strong which will assist in all of the activities listed. Your nutrition requirements may increase due to the extra calories burned. Remember that you can't out-train a bad diet; fuel your body properly with healthy eating. Remember to be sun smart and hydrate at all times. "Set goals or commit to a particular challenge..."
Research has proven that doing fitness for a purpose or setting goals with an end goal in sight will drastically improve your success rate. Also, if you have a cause in mind (cancer, homeless, wildlife, etc.) and train to participate in an event that will help a particular charity, your participation is all the more rewarding and have a greater impact on those who need the help in their battle. "How hard should I work to maximize fat loss?" A popular myth is that there is a specific range of heart rates in which you must exercise to burn fat. Even many cardio machines display a "fat-burning zone" on their panels, encouraging people to exercise in a specific heart rate range. Have you ever wondered if you really have to exercise in a specific heart rate zone to lose fat? And what happens if you venture out of that zone?. For fat and weight loss, what matters most is the difference between the number of calories you expend and the number of calories you consume. Fat and weight loss is about burning lots of calories and cutting back on the number of calories consumed. For the purpose of losing weight, it matters little whether the calories burned during exercise come from fat or carbohydrates. Intensity levels are the key to burning more calories. The higher the intensity the more calories you burn. The hardest part about working out, is keeping it interesting. With the change in weather, terrain, and scenery, exercising outdoors will add a great variety to anyone's lifestyle. Try these four tips to help you get started, or to challenge yourself: Use the Elements: Try Hiking, use sturdy sticks for "urban poling", climb a hill, challenge different Muscle groups each routine. Combine strength training with cardio. Change the pace: Weather allows you do different things to keep it fun: swim, ski, lawn and yard work. Run in intervals, challenge yourself to tennis skills.